An exciting new campaign hit the streets of Limerick last week with the launch of the Population Approach, an initiative that promotes positive parenting to all parents and families in Limerick. The campaign features images of local children on buses and billboards throughout Limerick city with the message that “being a parent is the most important job in the world”. The advertisements also direct towards www.loveparenting.ie, a new website dedicated to providing parents with high quality information on some of the elements of how positive parenting can support their child’s development and how they can access further support if they are finding some elements of parenting (or perhaps all of it) a little challenging. Speaking on the Population Approach campaign, Maria O’Dwyer, ABC Start Right Manager, stated: “Research shows that good quality early years experiences have a lasting impact on children’s learning, health and development. The quality of parenting that a child receives has a major impact on their development. A warm, positive relationship with parents makes children feel safe and secure and this helps them to grow in a way that is healthy and happy. To be able to provide this security for children, parents need to feel confident in their role. With this campaign we hope to emphasise the importance of a positive relationship with your child. It is premised on the belief that many small changes can have a greater effect on the whole population than major changes for a small proportion of the population”. This universal parenting campaign complements the more targeted interventions that take place around the city. It is based on evidence and outcomes from the Triple P Programme in Australia where such a campaign was run with significant outcomes. The design and development of the Love Parenting website www.loveparenting.ie was the first step in the Population Approach to Parenting. This next step will see an advertising campaign that will be visible throughout the city for the next two years. 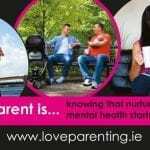 (1) The design and development of a website dedicated to the promotion of positive parenting: www.loveparenting.ie. The website was launched in January of this year. The main focus of all content on the site is positive interactions between parents and children, covering areas such as secure attachment, consistent disciplinary methods, play ideas, understanding teenage children. (2) The use of signage on city-suburban buses bill boards and local media. The themes used in the campaign will change in 8-week cycles and include; valuing your role as a parent; mental health; interactions; physical health. A weekly article will also run in the Limerick Post in association with the campaign and will feature articles from members and associates of Parenting Limerick. (3) Positive Messages will be carried on pharmacy bags across the City, used for all child-related products (i.e. medicine, toiletries etc. ), while smaller-version posters will be displayed in community settings, such as crèches, schools, health clinics and GP surgeries. (4) Workshops: Community partners in Parenting Limerick and beyond will provide practical advice, workshops and information that support the current theme. The purpose of love parenting is to provide parents with high-quality information on some of the elements of how positive parenting can support their child’s development at each stage and how they can access further support your if you are finding some elements of parenting (or perhaps all of it) a little challenging. I consent to Love Parenting collecting my details through this form.